If you are considering joining Consulting Room but wondering what you'll get for your money, please have a read of the many benefits that we provide to our members. 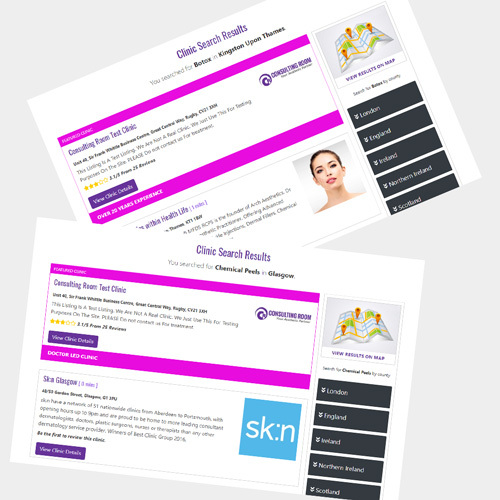 Inclusion in our Clinic Search UK & Ireland directory; potential clients can find you via town/city, treatment, product, condition and clinic name searches; (with non-alphabetised search results). Be listed in your nearest town by postcode, plus additional surrounding towns/cities/counties. Stand out from the crowd by investing in a highlighted listing to make your profile more prominent in your local search results. Stand out even more with our 'featured listings' facility. Simply select a treatment, product or condition and a county where you want to feature highly, and you can purchase a 'top slot' on those search pages for a period of six months, guaranteeing you top billing above all other service providers in that location. A written clinic profile (no text limit). Direct contact form for rapidly generated new client leads. Option to include unlimited images and galleries (e.g., corporate logo/banner, in-clinic vistas, treatments, or before and after images (which can be linked to display on our FAQ pages) and photographs of staff). Full contact details, with tracked click-throughs, for address, telephone, social media and website links, plus directions to your clinic with an automatically generated Google™ map. Social media links including Facebook, Twitter, Instagram, You Tube, LinkedIn and Pinterest pages, plus your clinic's blog. Treatments/procedures offered in your clinic, linked to Consulting Room Treatment FAQ pages with the option to include your pricing, plus space to include details of Extra Treatments such as spa offerings or bespoke treatments. Products offered in your clinic, linked to Consulting Room Product FAQ pages. Conditions or concerns treatment in your clinic, linked to Consulting Room Condition FAQ pages. List your available services and facilities, such as weekend appointments, disabled access and free parking. Add current special offers and forth-coming events; these are also shared on Consulting Room consumer-facing social media platforms. Written staff biographies (no text limit), including one image per person. Links to accreditations (e.g., regulatory bodies, trade organisations and educational bodies where membership or registration is held and can be demonstrated). Option to include videos, hosted via You Tube or Vimeo to highlight your clinic or particular treatments/products which you offer. These can also be linked and displayed on our FAQ pages. Reviews and recommendations so you can build up support for your service. Encourage your patients and clients to leave reviews for your clinic via Consulting Room, these are actively indexed by Google for improved SEO. Access to our secure Members Area, (includes the Business Hub, Ask Ron, Consulting Room Academy and Business Assist, plus information on legislation, organisations, clinical information, supplier deals and much more). Update your clinic listing, plus access website traffic statistics for your pages, including click-throughs to your social media pages and to reveal your telephone number. Keep all staff members up to date with our quarterly printed 80-page industry magazine (available online exclusively for members, plus a printed copy sent in the post), updating you with CPD-certified articles on aesthetic treatments, trends, clinical topics, industry news, legislation, business issues, training, new product reviews and more. Plus receive a weekly e-news email with latest news and updates for the sector. Certified reception training in our Consulting Room Academy - Generate £1000s in extra income by converting calls to consultations with call-handling and CRM training. The Art of the Consultation, certified therapist and aesthetician training in our Consulting Room Academy - Learn strategies to earn £1000s extra by maximising rapport building and sales conversions. Access to an archive of CPD-certified presentations and exclusive educational content in the Business Hub – A wealth of practical advice and strategies presented by experts who have real world experience in developing clinics in the aesthetic marketplace. Free advice via our Ask Ron facility - pick the brains of the man behind Consulting Room. Access to guidance and template documentation for Health& Safety, Human Resources and Employment Law compliance using Business Assist. Increase your media and industry profile by contributing to our Blog with links to your website and email. Engage directly with consumers via our Cosmetic Community. Provide before and after photographs for inclusion in our Treatment FAQs pages (full source statements). Direct access email and telephone helpline for business support and help running your clinic – if we don’t know the answer, we usually know someone who does! For the full range of member benefits read our Consulting Room Guide to Member Benefits. Non-Surgical and Surgical Clinics - £32.00 per month (inc. VAT) for membership paid via monthly Direct Debit. For more information on ways you can pay for your membership, please see the Payment Options. Email any questions to admin@consultingroom.com or telephone 01788 577254 for more information. Still not convinced? Then why not see what our members say about our services.